Oh boy! I have the most delicious dessert for you today! Chocolate and cherries are my all time favorite flavor combination. With the holidays quickly approaching, I know you all are looking for that special dessert that will WOW your guests. I have to give a shout out to my husband for the original inspiration for these little babies, I’ll think you will agree he came up with an awesome idea. 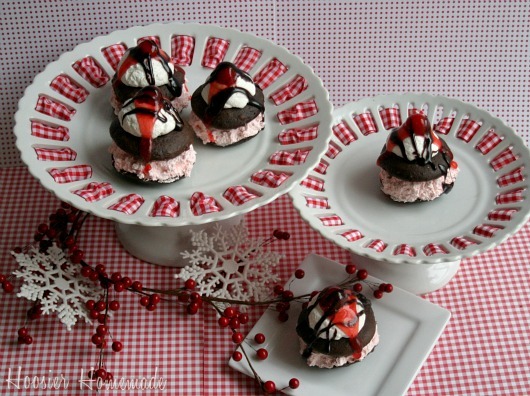 But let’s not delay any longer and be prepared to be the hero when you make these Black Forest Whoopie Pies!! Serving a special dessert for a Dinner Party, Holiday Get-together or even a Girl’s Night In can sometimes be difficult with everything else there is to do. I love desserts that look amazing…look like you spent hours on them…but are really easy. 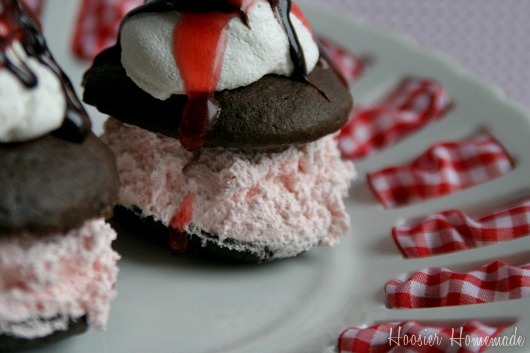 These Black Forest Whoopie Pies are simply amazing! Everyone will be wanting the recipe but it can be your little secret how easy they are. Oops…sorry! I will pause a minute so you can clean up that drool off your keyboard. Ok…I’m back. 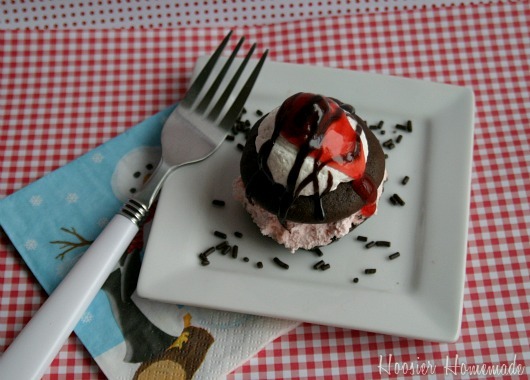 Here are the products that you will need to create these mouthwatering Black Forest Whoopie Pies. 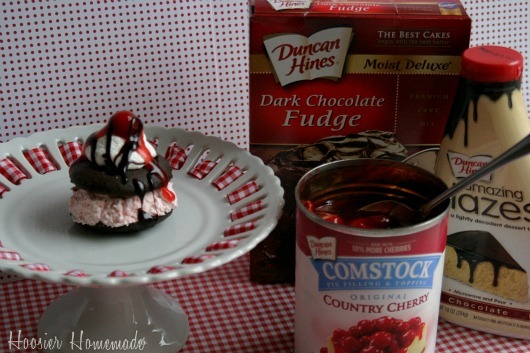 A decadant Dark Chocolate Fudge cake mix from Duncan Hines, Comstock Cherry Pie Filling and the new and oh so fun to use, Duncan Hines Chocolate Glaze. Yes you read that right, these amazing little treats start with a cake mix…you all know I LOVE easy! Sorry…I’m at it again! Making you hungry! I LOVE making Whoopie Pies – especially chocolate. I also love cherries so this sounds like a winning combination! And now I want a whoopie pie pan! Wait! I just went back and read that you didn’t use a special pan. Yeehaw! Thanks for stopping by Sara! Happy Holidays to you and your family! These Look AMAZING! We would love you to share this at Sixsistersstuff.com on Saturday for our Strut Your Stuff Link Party. Hope to see you there! Those look delightfully sinful!! Thanks for sharing! 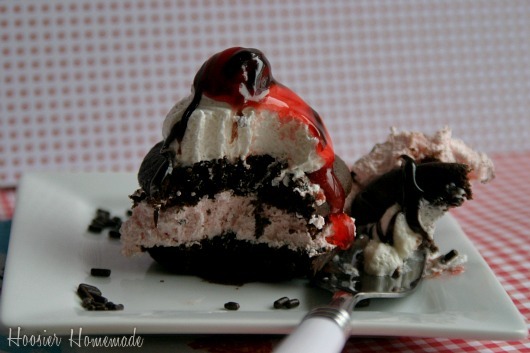 Oh, the black forest whoopie pie looks amazing. If you want to share, our party is open. Those look absolutely delicious! And I’m in love with that serving platter. It’s gorgeous!